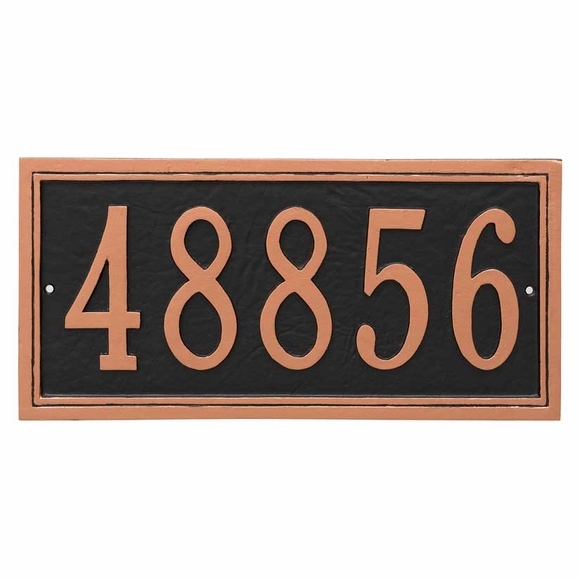 Freemont Rectangle Address Plaque - - one-line personalized address sign five (5) jumbo 4.5" characters providing great visibility. Wall mount or lawn mount with optional lawn stakes. Made in USA. Sophisticated and elegantly personalized house sign with an understated decorative border that accentuates the rectangle shape. Hand cast with recycled aluminum. Twenty-six different color schemes including three premium combinations (aged bronze/gold, swedish iron/silver, and swedish iron/black). Border is the same color as the personalization. Available with or without two 23" lawn stakes. Recycled cast aluminum construction. Characters and border are integral components of the sign, not added on. Made for you in the USA.